On September 10, 1939, Canada declared war on Germany. As a nation at war, the roles and functions of the Royal Canadian Mounted Police were critical for national security and the safety of the state. Despite the need for a trained and competent police force within Canada, many members of the R.C.M.P. wished to serve with the forces and sought leave to resign and enlist in one of the armed services. The government emphasized the need for the trained members of the R.C.M.P. for the defence and security of Canada, but allowed the national police force to field a “representative unit to be recruited from the R.C.M.P.” This unit was mobilized as No 1 Provost Company (Royal Canadian Mounted Police). It was assigned to 1 Canadian Infantry Division (1 CID), to carry out the roles and duties of the Canadian Provost Corps in that formation for the duration of the war. No 1 Provost Company (RCMP) embarked for the United Kingdom in December of 1939. For the next 3 ½ years the Company performed duties typical of the provost. Discipline within the division and learning and applying the skills of war occupied the unit during those years in Britain. In 1943, 1 Canadian Infantry Division landed in Sicily and No 1 Provost Company (RCMP) deployed on war service. For the next year and a half, No 1 Provost Company fought with the regiments of 1 CID through Sicily, the invasion of Italy and in the campaign up the Italian peninsula. In early 1945, with the rest of 1 Canadian Corps, No 1 Provost Company was transferred from Italy and re-united with the First Canadian Army in Northwest Europe. Here, No 1 Provost Company participated in the campaign to liberate Holland and in the final drive into Germany. RCMP tablet pattern title. In the fall of 1939 No 1 Canadian Provost Company was authorized to wear RCMP insignia. Under this authority, No 1 Coy C Pro C obtained small red on black embroidered titles reading RCMP and brassards reading RCMP. Photographic evidence indicates that the tablet pattern of RCMP title was obtained in Canada and worn before the Company embarked for overseas. Subsequent issues were acquired in the United Kingdom. The titles are rectangular in shape, approximately 2 ½ inches long by 1 inch high, red on black. These titles were replaced by the fully spelled out title. Photo evidence from the time period indicates that the title was worn in combination with the brassard reading R.C.M.P. 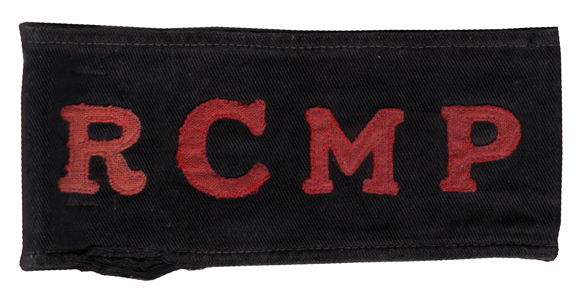 Royal Canadian Mounted Police, red embroidered on black, fully spelled out title. Various patterns exist. Archive documentation indicates that these were authorized July 13, 1942. It is not certain when the titles were actually obtained for issue and the varieties of these titles extant, suggest that there were several makers and / or several issues purchased. The members of No 1 Provost Company may also have privately purchased their examples. A DND Memorandum dated August 14, 1944 notes that long style titles for the Royal Canadian Mounted Police had never been provided in Canada. Royal Canadian Mounted Police red flocked (painted) on black felt. Flocked pattern titles are scarce and evidence suggests that flocked pattern titles were made in Canada. Though similar to the approved pattern of shoulder title the flocked issue had a red border incorporated in the design which was not found in the approved embroidered and printed patterns. These titles are unofficial and no approval has been found. The Canadian government considered adopting flocked pattern titles but found them to be unsuitable for use. Royal Canadian Mounted Police, printed pattern canvas title, first issued early in 1943. Subsequent printings were made through the end of the war. 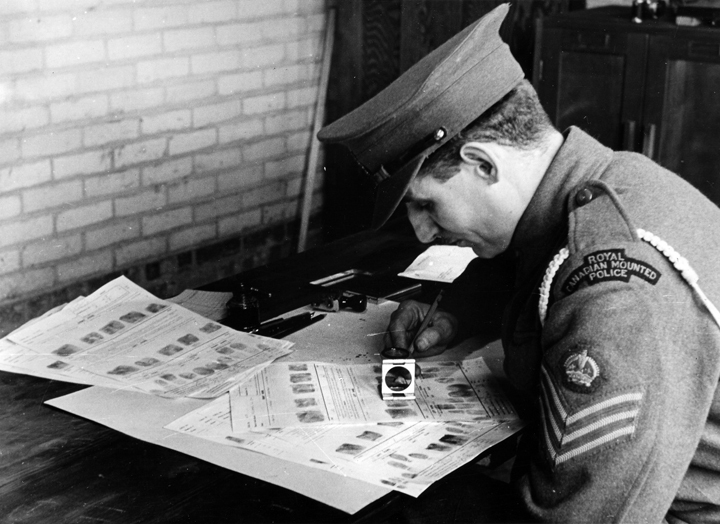 Printed titles were authorized by the Canadian army in late 1942, but it would be over two years before all units of the Canadian Army overseas would get their issues. Some units of 1 Canadian Infantry Division were issued printed titles before embarking for Sicily. RCMP armband. The armbands are made with red cloth letters sewn on a heavy black cotton armband. The first issue was acquired in Canada, and subsequent issues were likely purchased in the U.K.
Not illustrated. 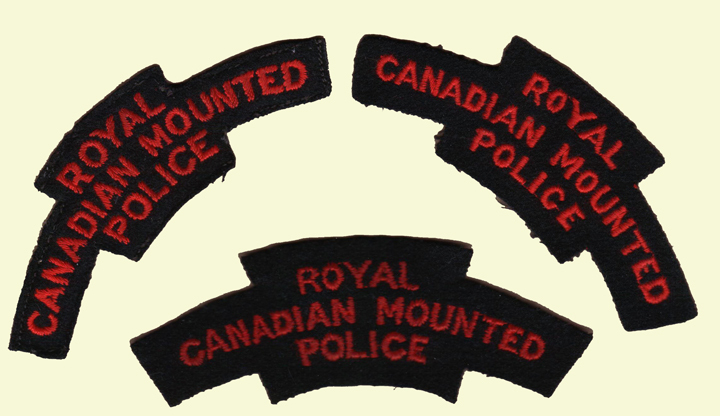 Armlets can be found with the Royal Canadian Mounted Police (spelled out title) over the 1 CID patch on khaki drill material. Various rank badges can be found on these as well. These were worn with the summer issue uniforms in Italy. There has been some confusion with the R.C.M.P. titles, black embroidery on red. That pattern of title was worn by the Royal Corps of Military Police and was never authorized for, issued to, or worn by No 1 Provost Company (R.C.M.P.). This provides an overview of the main patterns of cloth unit insignia worn by No 1 Provost Company (R.C.M.P.) during the Second World War. Corrections or additions are welcome. Canadian Military Police Virtual Museum, http://mpmuseum.org/index3.html. Nicholson L.H. Battle-dress Patrol No.1 Provost Company (R.C.M.P.) 1939-1945. Access to History Publications, Ottawa, 1992. Hill C.H. Lt.-Col., D.P.M. CMHQ, Letter: Shoulder Patches, to B.G.S. (Cdn). VII Corps, September 19, 1940. RG 24 Vol 10040 to Vol 10056. Memorandum Department of National Defence HQS 8700-1, DOS. (GS). July 13, 1942. Library and Archives Canada RG 24. 5 Canadian Armoured Division had landed in Italy in late 1943, and with 1 CID had formed 1 Canadian Corps. The transfer of 1 Canadian Corps from Italy to NW Europe was code named Operation Goldflake. Dear Sir, In your summary I see no mention of No1 Provo Co. RCMP. with the B.E.F in France in 1940. My father Cpl.RJ Kidston was there & was evacuated from Cherbourg. Do you have any further information or leads to help my research into his wartime service? Thank you.